Ther. 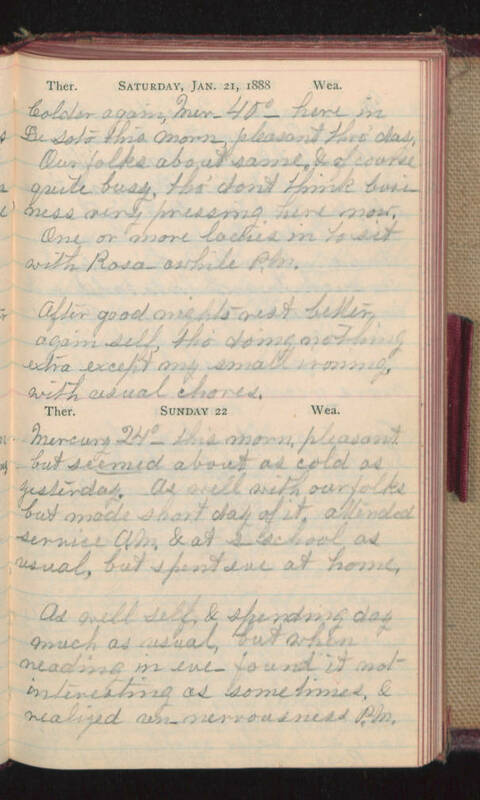 Saturday, Jan. 21, 1888 Wea. Colder again, Mer_ 40 [degrees] here in De Soto this morn_ pleasant this day. Our folks about same, & of course quite busy, tho' don't think business very pressing here now. One or more ladies in to sit with Rosa_ awhile P.M. After good night's rest better again self, tho' doing nothing extra except my small ironing with usual chores. Ther. Sunday 22 Wea. Mercury 24 [degrees] this morn, pleasant but seemed about as cold as yesterday. As well with our folks but made short day of it. Attended service A.M. & at s_ school as usual, but spent eve at home. As well self & spending day much as usual, but when reading in eve found it not interesting as sometimes, & realized un_nervousness P.M.